Hillary Clinton Needs Your Help! I generally don't get on my soapbox about politics...well, I do, but usually not in this venue. My daddy, a yellow dog democrat, would be so proud! My concern is that Democrats are not getting behind the one person who can take back the country and head us in the right direction! Emotions are in play, rather than calculated plans to make the country work for everyone. We've had seven years of Bush...our economy is in the toilet, up to 50 million have no healthcare, we're in a war that makes no sense, and the stereotype of the ugly American isn't really a stereotype anymore. Apparently the business men of Washington haven't figured out that war in the Middle East is the norm. Perhaps a history major in Washington could step up to the plate! We are not going to make people play nice. It's time for smarter and more experienced heads to prevail! Under Bill Clinton, we were at peace, had a surplus, helped people off welfare to work, were perceived positively in the world, and generally we were in much better shape than we are now. There is an old joke circulating around the Internet, that if the Wise Men had been women, they would have cleaned the stable, made a casserole...well you get my drift. Our country is ready for a realistic view of what the people of the U.S. need. I'm not asking you to vote for Hillary Clinton because she's a woman; I'm asking you to vote for Hillary because she's the best person for the job. I like Obama but he's young, head strong and does not have the global exposure to run the country. In case you haven't noticed, Bush was younger, wasn't very experienced or educated, and had no global exposure, and look where we are now!!! Ok...enough already. If you think logically, examine the capabilities of those running, both Republican and Democrat, I think you'll see that Hillary is the best all around candidate. Just consider it! We've had a fabulous week! On Monday, we went to Navarre Beach which has the best shelling I've found. We picked up two bags of really pretty shells...scallops, olives, augers and a few small conchs for just a few. Or is it conch? I'm not sure what I'm going to do with them, but we'll see. We also found the mall...didn't go...but found it! When you are retired you get excited about a new sweatshirt...nothing "designerish"! Had to visit the RV place to get a new water filter, but of course, I had to look at new coaches! We looked at a Newmar diesel, but I'm just a Winnebago/Itasca kind of girl. The only way we'll get a new coach is if we win the lottery! So far we've not seen one we like as well as the layout we have. After two months, we're still doing great in a confined space. This is officially now the longest we've stayed in the coach! We've definitely decided we like it better than living at home in Hendersonville! Now we have to decide what to do with the house. Perhaps we'll put it on the market again and just see what happens. We'd love to own something in Florida...just look at that sunset! There was an article about a couple paying $1200 per month for insurance in the Keys! It's not much better here in Destin. Guess that's off the table! We'll just stay with our rolling home! This week has been a bit cool...in the high 50's. We've walked every morning at least two miles. One mile in the park and then one mile on the beach. I'm determined to get in shape for Montana and the altitude and mountains. Not losing any weight, but firming up. We're eating seafood constantly! plus a little key lime pie here and there! We also went to Dewey Destin and had our gumbo and split a fried shrimp dinner. I worked some this week as well...the editing business is doing great and with the market tanking, it's a good thing! I'm also responding to tons of articles on Hillary Clinton...when there is a place to comment, I do! Look for posts from TranquilityFound or Healthcare for All! That's me. I'd love to be in Nashville working the phones, but instead I work the Internet! 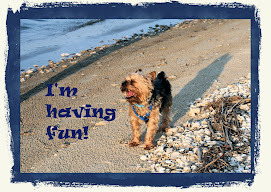 Woody is having a ball...there are tons of boys here to play with...he's actually getting up with me to walk. We agreed to 9:00 plus or minus 30 minutes! So we stay up late and get up around 9:00! Works for us! Today was Wally World day and Sam's day! Our two favorite shopping places. Came home and did a little housekeeping, and walked the beach! Life is good at Miramar Beach! Just wanted to share with you this pristine beach. Sunday in Miramar Beach! A time for reflection and football. Life is good! 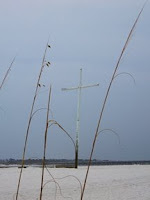 This is the Cross at the entrance to Destin Harbor. It welcomes fishermen home and guides them as they leave. We sent David and Estelle off Friday after a trauma that only duct tape fixed! RV's are quite complex...there is always something breaking! He'll have to tell you his story when he recovers! I did remind him that Woody and I had to duct tape a window in when it fell out....so welcome to the family! Estelle and I had a great religious debate about the phrase "God helps those who help themselves"...she's right, those exact words are not in the King James Version of the Bible but the message is in the new age versions! Ben Franklin based his statement on something in the Bible! The following is open for your interpretation! And being still a bit Catholic, Ignatius of Loyola said,"Work as though everything depends on you, Pray as though everything depends on God. "God gave us gifts so that we may use them, we should not simply pray and then refuse to use the gifts that God has given to us. deuce-and-a-half, a john boat and a helicopter!!" So I stand by "God helps those who helps themselves" in an interpretive fashion is in the Bible, even if the exact words are from Ben! Brother Barker, one of my favorite pastors and college professor, would be proud that I remembered from my college Bible class that the Bible in its many translations and forms is inspirational, open to interpretation, but always to be read! BUT....God helps the helpless...So we're both right! And you've had my sermon for the day!!! fellowship and food! And canasta! Unfortunately, Estelle and I lost the tournament but finished strong! At last count I think it was 5-2 in favor of the boys. I tried to make if 5-3 but Woody corrected me! Just wait til next year! Yeah! I was right. Estelle just emailed me and verified it was 5-3! Tomorrow we're going to Cape San Blas and Appalachicola...one of our favorite places. We'll take Andy so he can run on the beach....they like dogs there! Not here...too high falutin...is that a word? Is it spelled right? I do have to go work on a paper from Japan! Always the Editor...and working! Go Colts and Go Giants! My life would be complete if Peyton played Eli in the Super Bowl! We're so excited that Estelle and David have joined us in Destin...well really, Miramar Beach. They arrived yesterday, and after lots of oysters, shrimp and key lime, of course, we got down to canasta! Last year Estelle and I trounced the boys, but tonight we were slaughtered! We lost by like 2 million! Well maybe, not that much...but lots. It's quite cut throat and after some disagreement about who won last year's tourney, we have a book where we record scores and have to sign just like a golf scorecard. It's finally getting warmer here with temps heading back into the 60's and low 70's this weekend. We didn't unhook our water filter and hose a few nights ago...the filter froze and popped! Last night we unhooked! Hopefully we will not have any more freezing nights...I just read that it was so cold in Miami that the iguanas fell out of the trees. Apparently they fall asleep when it gets cold and then they fall out of the trees. So, if you're walking in Miami, watch for falling iguanas. Riley and Will went skiing this week...Riley was quick to say she would rather be on the intercoastal fishing! Thanks Jen for the pictures and a wicked snowplow from my son! Glad he didn't forget how to ski on ice...go for some powder next. You'll be surprised how much better you can ski when there isn't ice! This week has been fun with lots of walking on the beach, in the park, in the antique malls, and of course, WalMart! Sunday will be a challenge...Giants vs. whomever and Titans vs. Chargers! We'll be glued to the TV for both games. I've edited a bunch this week and actually started to work on a few of my own articles that I need to get submitted! Sold another picture this week..I have pictures in the camera that I need to get on to the computer! I thought I was retired! I'm about over my Helio and Julianne addiction...it's just not looking too good for the couple. They were so cute together! I'll still watch him race though which is good for the sport. Dancing with the Stars starts back in March! I'll keep my fingers crossed just in case. Our new friends Pat and Bob are heading into Mexico on the 8th...good luck guys and safe travels. Check out his new blog... www.rvingnorthamerica.blogspot.com I'm his unofficial blog helper! Woody says hello to all! and he is the king of canasta! Boo hiss!